No kidding, it really says that. The body of the Manifesto is 95 truisms about marketing in the Internet era, modestly patterned after Martin Luther's 95 Theses that sparked the Protestant Reformation. This implied equivalence between web browsing and one of the founding documents of western civilization is a priceless example of the attitudes that prevailed in the Bubble era. At the time of its creation, the Cluetrain Manifesto created quite a stir in the online community. Many prominent tech managers signed it, and it was turned into a book. Seven years later, you don't hear much about the Cluetrain Manifesto. And yet, it's still a very useful document. Parts of it are silly, and parts of it are just plain wrong. But a lot of it is brilliant. Once you pare away the BS and the posturing, it's a great document on the new world of Internet communication, and much of its advice is just as relevant and insightful today as it was in 1999. Maybe more so, because the technologies involved have matured. Most companies marketing online still ignore the Cluetrain's advice, to their detriment. Over at Rubicon Consulting, we've been trying to combine the best ideas of the manifesto with our own thinking, to create a short document that companies could use to guide their online communication. You're welcome to check out what we've written; we'd appreciate your comments and suggestions. I know it's presumptuous to mess around with an Internet icon like the Manifesto, but the original is too flawed and too weird to be taken seriously by most companies. An outstanding observation, but it needs an amendment: Online markets can be conversations. Most companies still market in the traditional way, using traditional marketing tools. They get into trouble when they take their traditional marketing reflexes into the online world. Because online media can be two-way, it's very insulting to use it in a one-way manner (for example, e-mail messages that don't allow answers, or weblogs that don't allow comments). That's as rude as refusing to respond to questions at a cocktail party. And people online often take the insult personally. True. And a corollary is that because every human being is an individual, no one belongs to a single market. We're each members of a unique rainbow of different markets. Maybe you're a Volvo owner and also a fisherman. The web lets you play both roles, and lets Volvo and a fly fishing outfitter speak to you directly in each role. In the old marketing world, we had to market to big segments like "males 18-25 years old" because mass media couldn't slice people any finer than that. When you're marketing online, mass market segments are irrelevant and inefficient because you can target much more finely. This needs some translation. The web lets you have conversations with your customers. You shouldn't put those conversations in the tone of a press release. Therefore, don't let your lawyers and PR agency write your online messages. Corporate-speak stands out online like a dead fish, and can be detected at the same distance. See point 3. In places the Cluetrain gets kind of repetitive. You get the feeling they were stretching it to get up to 95 items. Um, okay, I guess. Maybe this sounded revolutionary in 1999; now it's kind of quaint. Like listening to speeches by the hippies in People's Park in Berkeley. Okay. That's a little bit pompous, but there's truth in it. The real changes are just starting. Most people are not deeply engaged with online conversations, so the online impact on market behavior is spotty. If you're not careful, your online conversations can be diverted by enthusiasts who aren't a good proxy for the rest of the world. Remember Snakes on a Plane. This is just starting, and it's not always true. But there are cases in which the user community does indeed deliver better support than companies. I think the WordPress blogging tool is a good example. Yes and no. Definitely the Web gives a much louder voice to product enthusiasts outside of companies, so word about product flaws circulates faster than it did pre-Internet. But it's just a change in speed. Back before the Internet, there were these things called newspapers and magazines that were pretty good at spreading product information quickly. And with the application of enough money and effort, it's still possible to keep secrets. Look at Apple. Companies aren't just metaphysical constructs. They are organizations that pay employees money, and so they have a certain coercive power that markets can't match. I think there's a strain of wishful thinking in the Manifesto – because a lot of online people don't like traditional corporations, they're inclined to believe scenarios in which the corporation withers away. But I personally need to see the evidence to back up that belief, and it's lacking. Another repeat of point #3. Well, it has been more than a few years since the Manifesto came out. Most corporations still speak in he same language, and they don't sound any weirder than they did in 1999. Online, corporate-speak does sound weird. But in traditional media it sounds normal. The authors were making the mistake of thinking that the Internet was the future of all media. It's not – it's a series of new media that will live alongside the old ones for a long time. Wow, we go straight from a statement that was stupid to one that's very insightful. Because of its potential for personalization and direct communication, the web destroys traditional market segmentation. It creates (or maybe more accurately, it brings to light) a lot of small vertical markets in place of a few big mass markets. That only applies to the customers who are deeply networked online – a small segment of the population at present. Come back in a generation and this statement will be much more true. For now we're in a transition. But it sure is an opportunity. Um, no. A company gets an infinite number of last chances until some competitor wipes it out. Unfortunately, it's very hard to predict when that will happen, so companies that misuse online marketing are playing Russian roulette. Translation: Companies need to realize that a relatively small number of people online are laughing at them. But those people sometimes create YouTube videos that get forwarded all over the place, so you gotta watch out anyway. Unfortunately, most people aren't great at creating jokes. If they were, Robin Williams would be unemployed. I think what companies need to do is relax and act like themselves. If their reality is that they're a bit stern and somber, that's OK – as long as it's genuine. Nothing is more pathetic than a CEO trying to pretend that he or she is hip. This is why you don't ever see Bill Gates break-dancing. OK, you're not really talking about humor at all. So why did you say to get a sense of humor? There's a nugget of absolute truth in that last point. Many companies are deathly afraid of having an uncontrolled conversation with their customers, mostly because they expect to be overwhelmed by complaints. Ironically, the best way to reduce complaints is to listen to them and respond. You can turn most complainants into fans pretty easily, if you're just polite and respectful to them. Try apologizing when you've made a mistake – it does wonders for a marriage, and it can help a customer relationship as well. The Internet is a great tool for having this sort of conversation. This isn't even a full sentence, and it just repeats the previous points. That's occasionally true, but the word "most" is a gross exaggeration and hurts the credibility of the manifesto. Most marketing programs are like someone going on a first date – you try to make yourself look good, and accentuate your best qualities. Most people (and most companies) won't outright lie, and fear is not companies' greatest motivation. No, no, no, no. This point implies that brand marketing is coming to an end. Brand marketing will evolve because of the Web, but well-run brands can and will develop deeper and more meaningful relationships with their customers. At the risk of over-stressing the metaphor, they can go from going steady to getting married. I think that the manifesto went wrong on this one because a lot of the online crowd views branding as a form of pure evil; they think it clouds consumers' minds to the reality of product features. But most human beings aren't wired that way. They like being associated with a brand that shares their values, because it says something about them. The Web makes it possible to communicate values more thoroughly, so the bonds to a brand can be deeper. The first two sentences are exaggerations. In particular, unless a company is selling only on price, the Internet doesn't make customers any more mobile than they were in the past. But if you are selling just on price, watch out. All the more reason to use the Internet to form deeper ties with your customers. The third sentence is true, by the way. The way I'd put it: "Never love a company -- it can't love you back." I don't know what a smart market is. Markets can't be smart, people can be smart. People will indeed gravitate to suppliers who speak their language. But the outcome of this is going to be different than the online crowd expects – a lot more people speak the language of Wal-Mart than speak the language of Fry's. Yes!! Those are two of the best points in the whole manifesto. This is all pretty good. Item 37 is overblown, and I'm not sure what 39 means, but the ideas here are powerful. Dang, back to the overstatement. Companies can survive without belonging to a community of discourse. For example, if they're the cheapest supplier people will buy from them even if they are rude to their customers (if there's a Fry's in your town, go there on a Friday night and try to get customer service). But companies will get higher margins, make better decisions, and have more loyal customers if they participate in communities with them. No. That's another gross exaggeration that hurts the credibility of the whole document. First, not all companies make a religion of security. Second, companies want security for a lot of reasons. Competitive concerns have a lot to do with it, but so do financial regulations on stockholder lawsuits. And yes, there is some paranoia involved too. The important point – the one the Manifesto fails to make – is that the benefits of heavy information security are outweighed by the advantages of open discourse with customers. When you're online, it's more efficient to be open. Uh, yeah. But that's been true since the first corporation was formed. The conversations also happen in lunchrooms, hallways, and next to water coolers. They move a little faster on intranets, but the difference is not enormous. The benefits of intranets for driving internal conversations in corporations are substantial, but are not as great as they are for driving conversations with and among customers. Before the Internet, company employees still had lots of ways to communicate. There were even jokes about corporate gossip being the only thing that travels faster than light. That's so stupid. Companies generally installed intranets to exchange e-mail. File servers and web access came later. HR policies were the almost last thing to go electronic, because HR teams are usually not very technical. Even today, in many companies you're more likely to get paper memos from HR than from just about any other company department. Paper feels more official to them. Sometimes it seems like the Manifesto authors' main experience of corporate life was reading Dilbert. A typical engineer's point of view, since they're the only ones in the corporation capable of building their own intranets. First sentence is good, second sentence is dumb. A union is very different from an intranet, and has very different effects. One's not more radical than the other. That's like saying a dog is more radical than a cat. Oh, please. Intranets don't scare most companies witless. Yes, but that's because engineers and technophiles tend to dominate the online conversation both outside and inside corporations. Org charts are still mandatory in any corporation, because they designate who controls the salaries of whom. There's a nugget of wisdom here, though. The Internet makes it possible for information to move more quickly, and for groups of smart people to coordinate their work directly. A properly designed company, taking advantage of electronic communication, requires much less detailed hierarchical control. But somebody still has to write the performance reviews. It isn't either-or. There's still an org chart, but there's also an informal network of people who share information and sometimes agendas. But that has always been true of corporations, an intranet just makes it more visible. Every generation thinks its parents were stupid, and in the second sentence you hear some baby boomers saying their parents had too much respect for abstract authority. Go read some books, guys. See how soldiers in World War II felt about abstract authority in the military, or how workers in 1910 felt about their bosses. Better yet, read the US Declaration of Independence and pay attention to the part where they talk about the king. There are an almost infinite number of conversations going on. The Internet can actually reduce the number of conversations, because it consolidates them. This thinking is dangerous, and not in a good sense. There's an idealized agenda in operation here, an assumption that bosses are stupid and that companies will make better decisions if the average employee talks directly to the average customer, and they then make a collective decision on what the company should do. The reality is that bosses are sometimes stupid, and in those cases the company will indeed do better work if the bosses are bypassed. But those companies generally go broke eventually anyway. In a well-managed company, it's important to draw a line between listening to input and making decisions collectively. Listening to input is almost always good. The internet can make for better input, meaning better decisions. That's fantastic. But making the actual decisions collectively is usually bad, because collective decisions reflect a compromised consensus. Products designed according to that process are often over-featured because they try to please everyone. An example: the Sony Clie handheld was beloved by online users but failed in the marketplace. Why? Too many features, too hard to use. Companies are most effective when they have smart management, and that management has the authority to make clear decisions and have them carried out by the staff. If the Internet undercuts that, it's not helping the company or the customers. Companies don't have IQs. Their managers do. And a company manager who passively "gets out of the way" and lets the market drive his or her decisions is not doing a good job. No, people want to talk to people. And it's good to enable that. But the company still has a role to play, and it needs its own decision-making. Translation: Come the revolution, the first thing we'll do is shoot all the marketing and PR employees. Spoken like a true engineer. If you substitute "customers" for "markets," this one is true. Yeah, sure. Tell it to Google. Reality: Most people don't like advertising. That's not the same thing as being immune to it. If people really were immune to advertising, companies wouldn't do it. Good! But keep in mind that the people you can reach online are not normal customers. They'll have lots of ideas, but unfortunately they can't speak for your typical users. Groovy, baby. Join the love-in. 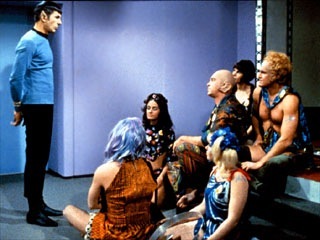 This is starting to feel like that old episode of Star Trek, where Spock meets the space hippies. Fair enough. Now that it's possible to have candid conversations online, it'll be perceived as rude not to have them. Most companies haven't realized that yet. Believe me, every company takes 50 million customers more seriously than one Wall Street Journal reporter. But most of them haven't yet figured out how to talk to 50 million people online. I agree with these. Most companies would come across better online if they allowed employees to communicate freely on the web. You can create some sensible guidelines (don't pre-announce products, label opinions as your own), and trust that most people will follow them. And if they don't, fire them. Being open personalizes your company, helps people feel good about it, and helps you make better decisions. The benefits of this outweigh the risks. The answer here is not to get rid of marketing, it's to teach marketing how to operate in this new world. Because, in reality, the engineers do have some other tasks they need to focus on. Translation: "We are arrogant and we don't know it. We think we represent all customers when in fact we represent a slice of them. Companies would be stupid to take all our rhetoric at face value. But our influence is growing, it would also be stupid to ignore the potential we represent. We are noisy, we influence a lot of purchases, and we're increasing in number." Well, it is to those of us who like to read and write blogs. But a lot more people watch TV. So in the real world companies will have to deal with both. Well, that one's a tad dated now. Be careful with timelines. Like almost all tech commentary written in the bubble period, the Manifesto assumes that the Internet is about to take over all communication and be used by all human beings. In the real world it's growing, but other media will continue to exist alongside it for a very long time. The Web is an accelerator more than a revolutionary. The Web speeds up conversations, and broadens their audiences. That's very important, and sometimes the increase in speed produces a qualitative difference. But our parents and grandparents were pretty clever, and most of the human principles we think we're pioneering online have actually been around for generations. Keep it short. Ten commandments are a lot more memorable than 95 manifestos. 5. Don't be afraid of passion. 6. Set your employees free. 7. The Internet strengthens great brands – and destroys false ones. 8. Forget about mass markets. 9. Remember that the Internet is still evolving. 10. Don't mistake the Web for the real world. They're not nearly as colorful as the Manifesto, but I hope they'll be more actionable. You can read the details here. *As pointed out by the authors of the Gluetrain Manifesto (a satire of the Cluetrain), it's hard to have the sky open to the stars when clouds are rolling over you all the time. But let's not quibble. The Gluetrain is no longer available online, but a copy was printed at the end of a Cap Gemini / Ernst & Young document here. If you want to understand what the Cluetrain authors meant by that "clouds and skies" imagery, there's an essay here that sort of explains. Posted by Michael Mace at 3:33 PM Permalink. 9 comments. Click here to read post with comments. Michael, excellent commentary and boil down of what's being said in the Cluetrain. It's interesting to see someone go through and dissect the 95 theses as you have here. Now replace the PC/Internet with a handset/cellular-network and see how many of the 95 tenets fall apart. My point? The Cluetrain Manefesto is highly specific to a particular network implementation: The Internet. No clues or tails out here on the cellular network prairie. By the way, LOVE the Star Trek reference. Spot on. I nearly had coffee running out of my nose I laughed so hard. I admire your stamina in going through all of these points. I usually zone out at number 15 or so. Thanks for giving us a guide to which of the cheese-puffier bits of this bloated classic we can safely skip. I like that you respect Cluetrain while you skewer it. At its core, the Cluetrain is a helpful way to think about communicating with customers. It definitely advanced the marketing conversation. BTW...for point 21, you'll need a more accurate example than, "This is why you don't ever see Bill Gates break-dancing." Bill Gates has done a whole bunch of gag videos over the years. One of the newer videos actually features Gates approximating break dancing side by side with Jon Heder (as Napoleon Dynamite). Gates also fights Napoleon for Taters. You could Google it up. – the manifesto is quite correct intranets are indeed built bottom-up!! And top-down intranets – managed by a dedicated KM/IT dept on orders/ policies set by top and/or middle management are not fun for employees – neither productive. 8. In both internetworked markets and among intranetworked employees, people are speaking to each other with a whole lot of italics. Ahhhh, saved by the Wayback Machine! "Maybe this sounded revolutionary in 1999..."
Yeah, actually, it was. What were you up to re: the net in 1999? How about incorporating any part of what the net means (or meant) into yours or your client's businesses? It was news then. It's still news. The short attention span theater of today's online pundits was, maybe, the only thing Cluetrain didn't predict. >>What were you up to re: the net in 1999? During the year before that, I was with a new business unit at Silicon Graphics, where we were building a destination site and online commerce system. Then for part of 1999 I was at SoftBook, where we were using the net to distribute books and magazines. We also did a lot of online marketing activity there, since we had no budget for other sorts of marketing. I also talked to a lot of web startups about potentially joining them; probably came closest with RealNames, but fortunately that didn't work out. I ended up at Palm instead. >>How about incorporating any part of what the net means (or meant) into yours or your client's businesses? Actually, that's a huge part of what I do in my day job. I can't write about most of it because it's confidential to our clients, but we did recently release some research here.